Dr.Mashoor Gulati as he brings his Clinic to your City! Get Ready to get cured by Dr.Mashoor Gulati as he brings his Clinic to your City! 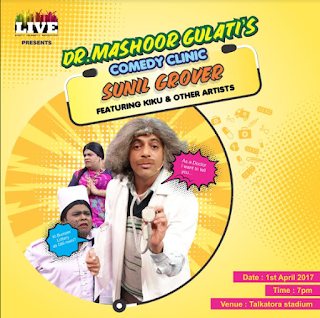 This April fools day a laughter riot is ready to hit Delhi as Dr. Mashoor Gulati AKA Sunil Grover and his band of crazy doctors get all set to examine the comedy patients in Delhi. Get ready for Dr. Mashoor Gulati's wisecracks as he examines audiences of different age groups, complexions and shoes sizes along with his fellow comedian Kiku Sharda and others.